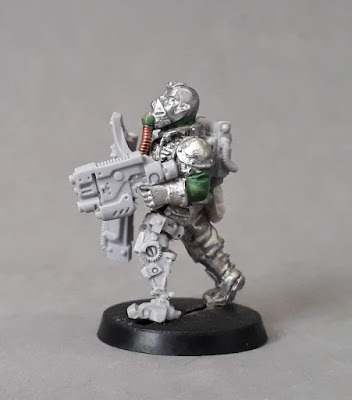 One of the elements that I really enjoy about an extended Necromunda campaign is the progression of your fighters. 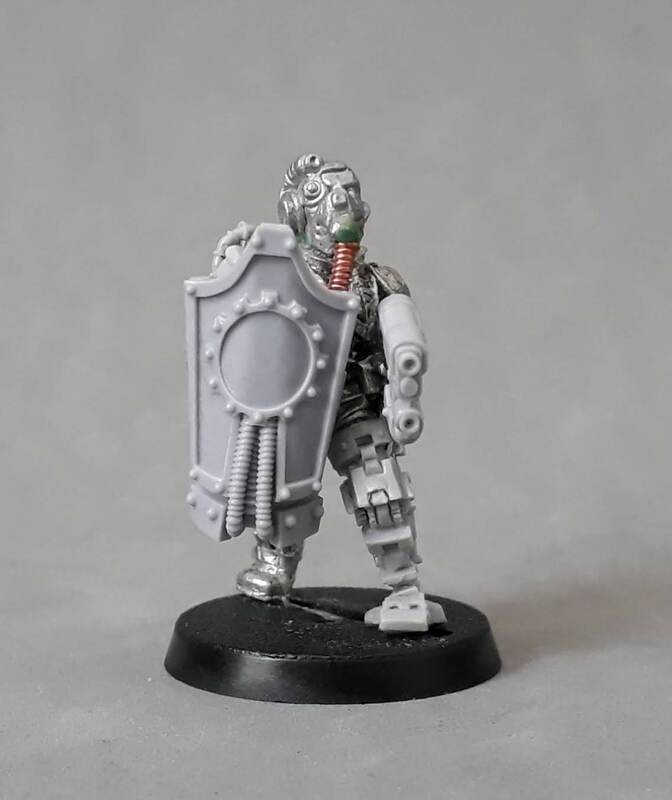 In the campaign I've been playing in for the last few months, my Tech gang, the Data Kings have gained some really useful fighters - Osbourne who can snipe almost anyone with his plasma cannon. Fischer who's a deadeye with his hot-shot lasgun. Of course Sinclair has a strength-sapping injury, and Celerity has a badly damaged hand, but that's all part of the fun. My Leader, Max Data, hasn't had too many progressions, but I have invested in some rather tasty gear. 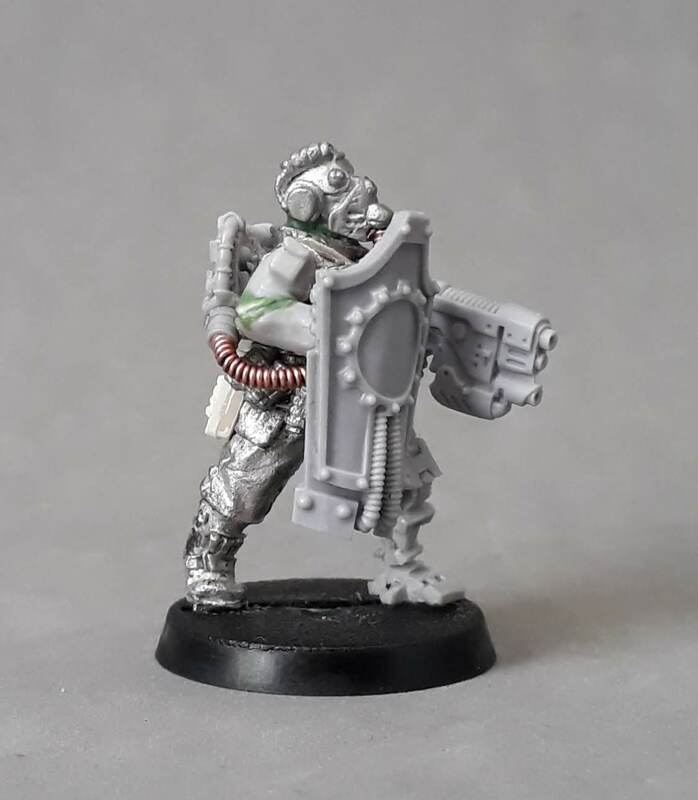 He now walks the underhive equipped with a las-plas combi weapon, energy shield, mesh armour, laspistol and a las projector. All this necessitated a new model to accurately represent Max Data and his gear. New Max got the same metal/white/black colour scheme as the rest of his gang, with the requisite orange and blue spot colours. I also added a little greenstuff to tie all the components together, and sculpt the tech rune on the energy shield. I chose all the components to fit in with the chunky industrial-looking tech that the original Tech gangers sport - using the plastic Van Saar energy shield for example, just didn't match aesthetically. Max has already participated in the last couple of games of the campaign, and will be leading the Data Kings' final foray in our planned multi-player finale this week. The mutie ambush unwittingly walks into a hail of plasma fire. Quite an imposing figure! I like that you put the shield on in such a way that it looks like it is being used, even if it covers most of the figure... I would have been tempted to go for a less active pose to show it off better, but I think your choice is ultimately the best. Posting our little man dollies can be challenging! I spent a lot of time thinking about the shield, and how to pose it. In the end I decided a functional pose would be better than having it hanging off the end of his arm - glad you approve! Is it even a conversion, though? Or a wonderful assemblage of diverse bitz!? Thanks Suber! I really enjoyed assembling his disparate parts. Great mix of bits and pieces both oldies and newer. Fits your theme perfectly and that sculpted icon in the shield is impressive! Thanks Dai! The icon is a pretty minor detail, but it filled the circle nicely and ties the shield to the details on some of the original Tech models. Did you have a clear picture in your head before you began converting him of how all the bit would go together? I didn't at all have a clear picture - in fact only the shield and bionic leg survive from the original planned figure. I didn't like the way he looked, so pretty much scrapped it and started again! Damn this is brilliant. It's fun to see characters evolving like that like Dyrske did before as well. Great job ! That's the best thing about campaigns really. I enjoy seeing characters develop (good or bad) and gaining extra layers of memorability. It's really nice to have played enough to have a legitimate reason to make a replacement for Max. And what a replacement too! As mentioned above, the decision to make the model look like he is actually using the shield is a good one. It fits with the functional, overalls aesthetic of the Techs. Great work. Good luck in the rumble Max! Thanks cheetor. In an ideal world, every character would get new depictions as they progress. But time and practicality means it's only the critical ones. Glad you approve of the practicality and function of his new gear! Thanks very much! I still have a few Techs left to paint, including a couple of the weird Marauder ones! Very nice piece of work, as usual! Mind if I ask what range the muties in the last image are from? The mutie in terracotta one-piece is from Citadel's Judge Dredd range. Thanks for sharing those links, they're from way back before I really started following your blog and so totally new to me. I was so inspired that I spent last night mainly kit-bashing, and three plastic Goliath gangers from the original Necromunda game ended up colliding with some wildly mutated Chaos Warrior heads. Another fantastic conversion. I have to say, modelling upgrades to my gang is one of the things that worries me about Necromunda. Thus far I've been sticking with the old figures and they are hard to find/ expensive for me, so the thought of buying more to chop them up is a tad off putting. In reality, most of your guys keep the gear they started with, or end up with non-visible upgrades such as grenades, gunsights, ammo etc. I only needed one replacement over a 14 week campaign, and that was pretty much what most people found. Great conversion and there's just enough of the oranges and blues to make the predominantly white color scheme look good. I think the paintjob needed the spot colours, otherwise it ran the risk of being a bit dull. Thanks!